What is the Best Foundation For Memory Foam Mattress? Now that you have purchased a great memory foam mattress, you will need to have a good foundation for it. Placing a mattress simply on the floor can result in dirtiness and will likely result in it moving around, which will lead to more wear and tear. In some cases, putting a mattress on the floor can even void a warranty. Why is it so important that a memory foam mattress – or any kind of mattress – has a good foundation or base? For starters, it helps keep the structure of the mattress intact. It will prevent sagging, reduce damage, and result in better comfort and a longer-lasting product. Some foundations can simply help raise a mattress up to the desired height next to a headboard, and some have storage space underneath, too! But how can you choose the right foundation for a memory foam mattress? For such a specialized product, don’t you need a specific kind of base? To help you figure it out, we have put together a guide on how to choose the right mattress base and have included some of our own personal product recommendations. Check it out! There are many types of foundations out there, but not all of them are suitable for memory foam mattresses. In order to find one that complements and improves on features of your chosen mattress, you have to be familiar with bases and their properties. Here are some popular mattress foundation types based on whether or not they can be used for memory foam mattresses. These foundations work as both a bed frame and a box spring replacement, providing all the support needed on its own. They are usually made from either foldable metal frames or wooden slats. Both of these kinds are constructed with spaces and holes between rods and slats in the base, making them perfect for memory foam mattresses as they provide space for airflow and good circulation, which is crucial in preventing the overheating of a memory foam mattress. The breathability will make sleep more comfortable and prevent mold and mildew buildup due to trapped moisture. Metal framed platform foundations are easy to use and are very strong and sturdy. Many are collapsible so you can store them away, even if they are heavy. Some even double as added storage space thanks to the height at which they stand off the ground. While many of these kinds of bases are solid, some are also flexible and bend to your body weight. This is great if you want a particular kind of support, although it may not be the best option for memory foam mattresses. On the other hand, wooden slat foundations are very rigid and are usually very sturdy. Many come with fabric covers so that your mattress does not snag onto the wood if it is not sanded. It is worth noting that in order for slatted foundations to be effective, the slats should not be more than 3” apart from each other, or else the mattress is likely to sag into the gaps. You can also fix this on your own by purchasing wooden slats separately and adding them to the base. Adjustable bases aren’t usually the first pick for anyone, but the fact is that they work surprisingly well with memory foam mattresses. This is due to their natural open cell structure, which improves breathability on warm mattresses. You can fit the bed into any position you like, and a memory foam mattress will easily contour itself to properly fit into your desired bed style. In addition, due to the fact that memory foam mattresses bounce back, you will not have to worry about deforming your mattress due to a particular position or incline that you set your adjustable base too. Memory foam mattresses will still provide the same level of comfort regardless of the inclination of your bed base, unlike innerspring mattresses. So if you are someone who needs to sleep in a specific way, you can do that easily with this type of foundation! Box springs are the most traditional kind of mattress foundations in the book, but they are typically not recommended for memory foam mattresses – or any non-innerspring mattresses, for that matter! They can be so bad for this kind of mattress that using box springs with memory foam mattresses may void a warranty, so if you want to use a traditional one, you would have to check with the manufacturer first. The good news is that many newer box springs have been manufactured specifically for memory foam mattresses, making them a solid pick as well. Box springs with middle support bars for added stability and preventing sag are great for this purpose. New box springs for memory foam mattresses will likely have removed their signature coiled springs anyway, and thus they become the aforementioned platform and slated foundations that you should be buying! Never simply lie your memory foam mattress on plywood so it does not come into contact with the ground. This is simply not good for the mattress, will not stop it from moving around, and is likely to result in wear and tear if the wood is not designed to have a mattress placed onto it. This will also void a warranty! First up we have the 100-night Home Trial. If at any point during the first 100-nights you decide that the frame is not for you, whatever the reason, Nectar will accept a return and refund your money no questions asked. Next, we have the “Forever Warranty” for which Nectar is very well known for. Their promise is simple…your foundation is guaranteed for as long as you own the product, meaning they will repair or replace it should there be any manufacturing issues…that's how confident they are in their products. Thirdly they offer a generous Free Shipping & Returns policy on all of their items. I don't know about you but the last time I purchased a mattress and foundation I paid a crazy amount of dollars just to get the thing shipped to my home. This basic, regular profile foundation is designed to properly support all mattress types, including memory foam mattresses. It measures 8” in thickness and is an alternative to box spring foundations. It is priced at a cost-effective figure, allowing for a more comfortable foundation at an affordable price. This product is held up by a strong hardwood, solid Spruce structure to prevent mattress sagging and damage and is reinforced with wooden slats for added sturdiness. Due to its build, it is silent and will not make noise even if you toss and turn. It is stable and provides the needed support for a restful sleep. The Classic Brands Instant Foundation is designed to be assembled by you in the comfort of your home. Thanks to its compressed shipment in a small box, the product can easily be moved through narrow hallways and carried up staircases, so you can get it into the right room no matter how big your chosen foundation size. Assembly instructions, a stretch cover, the needed parts and some tools are also included, and the set-up process takes around 20-30 minutes. To assemble, simply unpack the box and lay the outer perimeter onto a flat surface. These sides must then be screwed together before the middle slats – the support slats – are placed over the frame and screwed into them. Once this is done, the foundation can then be concealed within the provided stretch cover and secured with the built-in drawstring. A power screwdriver may be useful in the assembly process. There are some downsides to this product, however. The wood provided for assembly is not sanded, construction grade lumber, which some may take as an indicator of cheap quality. If you are particular about this kind of material, then you may not think highly of this mattress. Also, some may feel that the foundation does not provide enough support for certain mattresses. In that case, you can solve the problem by adding extra wooden slats between the others. Finally, the return window for this mattress foundation is a small, unspecified one that can make exchanges and refunds difficult. Reviews for this mattress are mixed. Most are positive, but it seems that the few negative reviews are quite drastic, so be careful to purchase from the right dealer! This split box spring foundation is fashioned from solid spruce and designed for a wide array of mattresses, including memory foam ones. It claims to be of a stronger build than other industry standard mattress bases and is also said to be eco-friendly. In addition, this foundation is FSS certified. Despite the “box spring” classification, this product does not feel particularly springy – and we mean that in a good way! It is quiet and does not creak, making it ideal for those who move around at night. It is rigid, solid, and does not shake or jiggle when you move on it. It is also one of the most inexpensive boxes spring foundations you can get, and it is often considered better quality than many higher priced ones in the market! This product was made as an alternative to traditional box spring foundations that may be difficult or impossible to fit through tight spaces. As such, the CPS Wood Products Premium Easy Fit Box Spring Foundation is completely collapsible, so it ships in a small box and can be folded up and moved around. Essentially, it is made to be able to fit just about anywhere. Due to its collapsible nature, there are no tools required for assembly, which is a quick and painless product that can be done in 10 minutes. If needed, it can then be collapsed again for storage purposes. It also comes with a good quality cover. There are some downsides to the product, as well. Quality control seems to be questionable, as some customers receive products made from low-grade wood, so you will have to be careful where you purchase from and be sure that you understand the refunds, returns, and exchanges policies well. The joints and connections are also double stapled and not nailed, and joists are not glued, so although the frame is strong, it may not be built durable enough for some. The wooden slats may also be spaced too far apart for traditional or latex mattresses but will work fine for memory foam. The Zinus SmartBase mattress foundation and platform bed frame are made for memory foam mattresses primarily, although it also works wonders for spring and latex mattresses. It is an excellent replacement for ordinary bed frames or box springs and stands 14” off the ground to allow for a roomy 13” of storage space beneath the bed. The frame itself is made of a strong steel, with several legs that come into contact with the ground and properly hold the bed up. Each leg is fitted with a plastic cab to prevent scuffing on the ground. The material of this foundation is highly durable and built to be strong so that you will not have any issues with mattress sagging, so no damage will come to your mattress as a result. This product requires little assembly and can be set up within minutes without using any tools. When correctly assembled, it makes no noise and does not creak at all, so even if you move around a lot in your sleep, you will still have a quiet night’s rest. After assembly, if you need to put the frame away, you can easily store it by folding the product back up again, which is easy to do as the product is lightweight. On the flip side, this product is designed for those of an average weight. So if you are heavier, you may find the foundation uncomfortable or experience mattress sagging. Above a certain weight, the product may simply break as it lacks in strength. In addition to that, if your bed uses a headboard that does not touch the wall or the ground, you cannot lean back on it if you use this foundation as it will damage the brackets. It is worth noting as well that if you do not have a memory foam mattress, this product may be very uncomfortable for you. Made from a high quality solid spruce wood that has been smoothly sanded, the DynastyMattress Wood Box Foundation is designed more all mattresses, and its slats allow it to work well for memory foam ones as well. It is made from a strong and sturdy material that allows it to be more durable than pre-assembled foundations and bases. There will be no issues with creaking or noise with this foundation, as it is sturdy and does not move easily. It is also well-structured so a mattress will not sag in the center of the base. The product comes with a cover and is designed for quick assembly and disassembly, and is very similar to the CPS Wood Products Premium Easy Fit Box Spring Foundation in this manner. It is collapsible for easy storage and transport and serves as a way to get a full-sized, bulky box spring through narrow spaces and into rooms. Assembly will likely not take longer than 10 minutes. The product also comes with a fire-retardant cover and all the necessary tools to put it together. With that being said, the grade of wood used for this product is not really of the highest quality, and you may also feel that it is a bit hard if your mattress is thin. In addition, the spacing between the wooden slates might be too far apart for some mattresses. You can fix this by purchasing wooden slats separately and independently performing a DIY fix. On top of that, quality control for this product is not known to be the best, resulting in very mixed customer reviews. Customer service for the company also will not cover the cost of return shipping should a refund or exchange be needed. This mattress foundation stands at a height that allows for 13” of storage space beneath it, and it is designed to be supportive of all kinds of mattresses – especially memory foam ones! It is a great replacement for a box spring foundation and can hold up to 1250lbs of weight, with some product descriptions claiming it can even take 2000 lbs. The LUCID Foldable Metal Platform Bed Frame and Mattress Foundation is made extremely stable so that your bed will not move or make any noises as you sleep, even if you toss and turn. The loudest noise you may hear from the mattress base is small squeaks under heavier movement. Mattresses are supported by a heavy-duty wire grid, welded together in a strong latticework. Leg support braces add even more to the promise of safety and durability. Assembly is fairly simple and will not take longer than an hour, as items needed are provided. Simply unfold the product as it arrives in a smaller, compressed form, place the bolts as directed and it is ready to use. The product is also foldable so that you can put it away easily if you need to store it and set it up again quickly in a pinch. This strong frame does have some drawbacks. For one, although it is meant to be easier to move than a full-on bedframe, it is still quite bulky and can be difficult to put away on your own. If you need to set up and collapse the bed every day, then this isn’t one that you will find easy to deal with as the bolts are tedious to remove. Some heavier customers have reported that despite the 1250lbs weight limit claim, they have had their frames bend over time. Other customers report that the product is very noisy, which points to quality control issues. You will also need to be careful when placing a mattress over it, as some areas of the frame may catch on fabric and tear it. So, what’s the best foundation for a memory foam mattress? Anything that has spaces to encourage air flow and does not allow sagging is great, and of course, one that will support you easily without groaning under the weight. 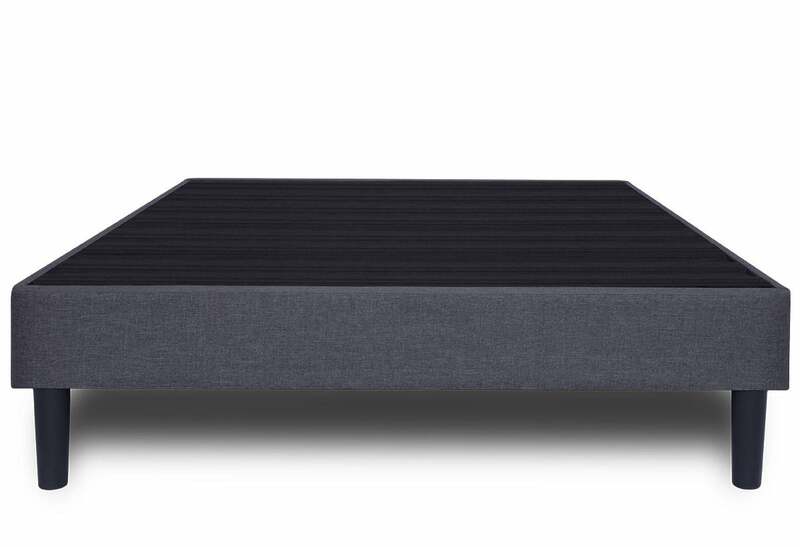 Personally, we are fans of the Zinus 14 Inch SmartBase Mattress Foundation. Not only is it one of the most popular mattress foundations in the market – with good reason! –, it is also durable, strong, and silent. All the while, it also provides the convenience of easy setup and foldability, which makes it a real winner in our eyes. Whichever base you end up choosing, make sure that it is indeed suited for memory foam mattresses, and take into account areas of importance as you do so. We hope this guide has given you a better idea of what to look for. Happy hunting, and sweet dreams! What are the Best Earplugs for Sleeping in 2019?